Hernando de Soto (c. 1495 – May 21, 1542) was a Spanish explorer and conquistador who led the first European expedition deep into the territory of the modern-day United States (Florida, Georgia, Alabama and most likely Arkansas), and the first documented European to have crossed the Mississippi River. A vast undertaking, de Soto's North American expedition ranged throughout the southeastern United States searching for gold, and a passage to China. De Soto died in 1542 on the banks of the Mississippi River in what is now Guachoya, Arkansas or Ferriday, Louisiana. Hernando de Soto was born to two parents who were hidalgos of modest means in Extremadura, a region of poverty and hardship from which many young people looked for ways to seek their fortune elsewhere. He was born in Jerez de los Caballeros, in the current province of Badajoz. :135 However, three towns—Badajoz, Barcarrota and Jerez de los Caballeros—claim to be his birthplace. He spent time as a child at each place, and he stipulated in his will that his body be interred at Jerez de los Caballeros, where other members of his family were interred. The age of the Conquerors came on the heels of the Spanish reconquest of the Iberian peninsula from Islamic forces. Spain and Portugal were filled with young men seeking a chance for military fame after the Moors were defeated. With discovery of new lands to the west (which they thought at the time to be East Asia), they were attracted to whispers of glory and wealth. Brave leadership, unwavering loyalty, and ruthless schemes for the extortion of native villages for their captured chiefs became de Soto's hallmarks during the Conquest of Central America. He gained fame as an excellent horseman, fighter, and tactician. During that time, de Soto was influenced by the achievements of Juan Ponce de León, the first European to reach Florida; Vasco Núñez de Balboa, the first European to reach the Pacific Ocean coast of the Americas (he called it the "South Sea" on the south coast of Panama), and Ferdinand Magellan, who first sailed that ocean to East Asia. Pizarro quickly made de Soto one of his captains. :171 When Pizarro and his men first encountered the army of the Inca Atahualpa at Cajamarca, Pizarro sent de Soto with fifteen men to invite Atahualpa to a meeting. When Pizarro's men attacked Atahualpa and his guard the next day (the Battle of Cajamarca), de Soto led one of the three groups of mounted soldiers. The Spanish captured Atahualpa. De Soto was sent to the camp of the Incan army, where he and his men plundered Atahualpa's tents. During 1533, the Spanish held Atahualpa captive in Cajamarca for months while his subjects paid for his ransom by filling a room with gold and silver objects. During this captivity, de Soto became friendly with Atahualpa and taught him to play chess. By the time the ransom had been completed, the Spanish became alarmed by rumors of an Incan army advancing on Cajamarca. Pizarro sent de Soto with 200 soldiers to scout for the rumored army. While de Soto was gone, the Spanish in Cajamarca decided to kill Atahualpa to prevent his rescue. De Soto returned to report that he found no signs of an army in the area. After executing Atahualpa, Pizarro and his men headed to Cuzco, the capital of the Incan Empire. As the Spanish force approached Cuzco, Pizarro sent his brother Hernando and de Soto ahead with 40 men. The advance guard fought a pitched battle with Incan troops in front of the city, but the battle had ended before Pizarro arrived with the rest of the Spanish party. The Incan army withdrew during the night. The Spanish plundered Cuzco, where they found much gold and silver. As a mounted soldier, de Soto received a share of the plunder that made him very wealthy; it represented riches from Atahualpa's camp, his ransom, and the plunder from Cuzco. De Soto returned to Spain in 1536,:135 with an enormous share of the Spanish conquest of the Inca Empire. He was admitted into the prestigious Order of Santiago and "granted the right to conquer Florida". :135 His share was awarded to him by the King of Spain, and he received 724 marks of gold, 17,740 pesos. He married Isabel de Bobadilla, daughter of Pedrarias Dávila and a relative of a confidante of Queen Isabella. De Soto petitioned King Charles for the government of Guatemala with "permission to create discovery in the South Sea," but was granted the governorship of Cuba instead. De Soto was expected to colonize the North American continent for Spain within four years, for which his family would be given a sizable piece of land. 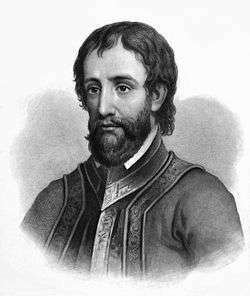 Fascinated by the stories of Cabeza de Vaca, who had survived in North America after becoming a castaway and just returned to Spain, de Soto selected 620 eager Spanish and Portuguese volunteers, including some of African descent, for the governing of Cuba and conquest of North America. Averaging 24 years of age, the men embarked from Havana on seven of the King's ships and two caravels of de Soto's. With tons of heavy armour and equipment, they also carried more than 500 livestock, including 237 horses and 200 pigs, for their planned four-year continental expedition. He then wrote out a new will before embarking on his travels. On 10 May 1539, Hernando de Soto wrote in his will: "That a chapel be erected within the Church of San Miguel in Jerez de Los Caballeros, Spain, where De Soto grew up, at a cost of 2,000 ducats, with an altarpiece featuring the Virgin Mary, Our Lady of the Conception, that his tomb be covered in a fine black broadcloth topped by a red cross of the Order of the Knights of Santiago, and on special occasions a pall of black velvet with the De Soto coat of arms be placed on the altar; that a chaplain be hired at the salary of 12,000 maravedis to perform five masses every week for the souls of De Soto, his parents and wife; that thirty masses be said for him the day his body was interred, and twenty for our Lady of the Conception, ten for the Holy Ghost, sixty for souls in purgatory and masses for many others as well; that 150000 maravedis be given annually to his wife Isabel for her needs and an equal amount used yearly to marry off three orphan damsels...the poorest that can be found," who would then assist his wife and also serve to burnish the memory of De Soto as a man of charity and substance. Historians have worked to trace the route of de Soto's expedition in North America, a controversial process over the years. Local politicians vied to have their localities associated with the expedition. The most widely used version of "De Soto's Trail" comes from a study commissioned by the Congress of the United States. A committee chaired by the anthropologist John R. Swanton published The Final Report of the United States De Soto Expedition Commission in 1939. Among other locations, Manatee County, Florida, claims an approximate landing site for de Soto and has a national memorial recognizing that event. The first part of the expedition's course, until de Soto's battle at Mabila (a small fortress town in present-day central Alabama. ), is disputed only in minor details today. His route beyond Mabila is contested. Swanton reported the de Soto trail ran from there through Mississippi, Arkansas, and Texas. Historians have more recently considered archeological reconstructions and the oral history of the various Native American peoples who recount the expedition. Most historical places have been overbuilt. More than 450 years have passed between the events and current history tellers, but some oral histories have been found to be highly accurate about historic events. The Governor Martin Site at the former Apalachee village of Anhaica, located about a mile east of the present Florida capital in Tallahassee has been documented as definitively associated with de Soto's expedition. The Governor Martin Site was discovered by the archaeologist B. Calvin Jones in March 1987. Many archaeologists believe the Parkin Site in Northeast Arkansas was the main town for the province of Casqui, which de Soto had recorded. They base this on similarities between descriptions from the journals of the de Soto expedition and artifacts of European origin discovered at the site in the 1960s. • The first account of the expedition to be published was by the Gentleman of Elvas, an otherwise unidentified Portuguese knight who was a member of the expedition. His chronicle was first published in 1557. An English translation by Richard Hackluyt was published in 1609. • The King's factor (the agent responsible for the royal property) with the expedition, Luys Hernández de Biedma, wrote a report which still exists. The report was filed in the royal archives in Spain in 1544, and translated into English by Buckingham Smith and published in 1851. • De Soto's secretary, Rodrigo Ranjel, kept a diary, which has been lost, but apparently was used by Gonzalo Fernández de Oviedo y Valdés in writing his La historia general y natural de las Indias. Oviedo died in 1557, but the part of his work containing Ranjel's diary was not published until 1851. An English translation of Ranjel's report was published in 1904. • The fourth chronicle is by Garcilaso de la Vega, El Inca. Garcilaso de la Vega was not a participant in the expedition. He wrote his account, La Florida, known in English as The Florida of the Inca, decades after the expedition, based on interviews with some survivors of the expedition. The book was first published in 1605. Historians have identified problems with using La Florida as a historical account. Milanich and Hudson warn against relying on Garcilaso, noting serious problems with the sequence and location of towns and events in his narrative, and add, "some historians regard Garcilaso's La Florida to be more a work of literature than a work of history." Lankford characterizes Garcilaso's La Florida as a collection of "legend narratives", derived from a much-retold oral tradition of the survivors of the expedition. The chronicles describe de Soto's trail in relation to Havana, from which they sailed; the Gulf of Mexico, which they skirted inland then turned back to later; the Atlantic Ocean, which they approached during their second year; high mountains, which they traversed immediately thereafter; and dozens of other geographic features along their way, such as large rivers and swamps, at recorded intervals. Given that the natural geography has not changed much since de Soto's time, scholars have analyzed those journals with modern topographic intelligence, to render a more precise De Soto Trail. "HERNANDO DE SOTO: Extremaduran, one of the discoverers and conquerors of Peru: he travelled across all of Florida and defeated its previously invincible natives, he died on his expedition in the year 1543 at the age of 42". In May 1539, de Soto landed nine ships with over 620 men and 220 horses in south Tampa Bay. He named it Espíritu Santo after the Holy Spirit. The ships brought priests, craftsmen, engineers, farmers, and merchants; some with their families, some from Cuba, most from Europe and Africa. Few had traveled before outside of Spain, or even their home villages. Near de Soto's port, the party found Juan Ortiz, a Spaniard, living with the Mocoso. Ortiz had been captured by the Uzita while searching for the lost Narváez expedition, and had later escaped to Mocoso. Ortiz knew the Timucua language and served de Soto as an interpreter as he traversed the Timucuan-speaking areas on his way to Apalachee. He established a unique method for guiding the expedition and communicating with various tribal dialects. He recruited guides from each tribe along the route. A chain of communication was established whereby a guide who had lived in close proximity to another tribal area was able to pass his information and language on to a guide from a neighboring area. Because Ortiz refused to dress as an hidalgo Spaniard, other officers questioned his motives. De Soto remained loyal to Ortiz, allowing him the freedom to dress and live among his friends. Another important guide was the seventeen-year-old boy Perico, or Pedro, from modern-day Georgia. He spoke several of the local tribes' languages and could communicate with Ortiz. Perico was taken as a guide in 1540 and treated better than the rest of the slaves, due to his value to the Spaniards. The expedition traveled north, exploring Florida's West Coast, encountering native ambushes and conflicts along the way. 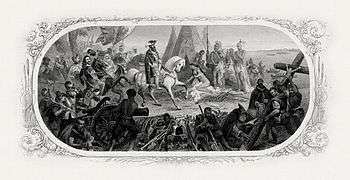 De Soto's first winter encampment was at Anhaica, the capital of the Apalachee. It is one of the few places on the route where archaeologists have found physical traces of the expedition. It was described as being near the "Bay of Horses". The bay was named for where the starving members of the preceding Narváez expedition killed and ate their horses while building boats for escape. De Soto headed north into the Appalachian Mountains of North Carolina, where he spent a month resting the horses while his men searched for gold. De Soto next entered eastern Tennessee. At this point, De Soto either continued along the Tennessee River to enter Alabama from the north (according to John R. Swanton), or turned south and entered northern Georgia (according to Charles M. Hudson). The route that Swanton proposed in 1939 is still generally accepted by most archaeologists and by the U.S. government as the route of the de Soto expedition. The maps on this page (and others) depict Charles Hudson's proposed route, but it has not been substantiated by archaeological evidence, and is not considered the consensus route by academicians. De Soto's expedition spent another month in the Coosa chiefdom before turning south toward the Gulf of Mexico to meet two ships bearing fresh supplies from Havana. Along the way, de Soto was led into Mauvila (or Mabila), a fortified city in southern Alabama. The Mobilian tribe, under Chief Tuskaloosa, ambushed de Soto's army. Other sources suggest de Soto's men were attacked after attempting to force their way into a cabin occupied by Tuskaloosa. 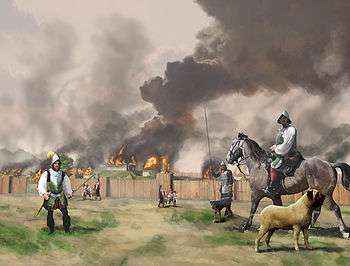 The Spaniards fought their way out, and retaliated by burning the town to the ground. During the nine-hour encounter, about 200 Spaniards died, and 150 more were badly wounded, according to the chronicler Elvas. Twenty more died during the next few weeks. They killed an estimated 2,000-6,000 warriors at Mabila, making the battle one of the bloodiest in recorded North American history. The Spaniards won a Pyrrhic victory, as they had lost most of their possessions and nearly one-quarter of their horses. The Spaniards were wounded and sickened, surrounded by enemies and without equipment in an unknown territory. Fearing that word of this would reach Spain if his men reached the ships at Mobile Bay, de Soto led them away from the Gulf Coast, into Mississippi, most likely near present-day Tupelo, where they spent the winter. 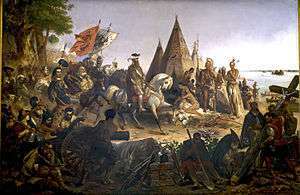 On May 8, 1541, de Soto's troops reached the Mississippi River (Alonso Álvarez de Pineda was the first European to see it, in 1519, and sailed twenty miles up the river). De Soto had little interest in the river, which in his view was an obstacle to his mission. There has been considerable research into the exact location de Soto crossed the Mississippi River. A commission appointed by Franklin D. Roosevelt in 1935 determined that Sunflower Landing, Mississippi was the "most likely" crossing place, where de Soto and his men spent a month building flatboats, and then crossed the river at night to avoid the Native Americans who were patrolling the river, and with whom De Soto had previously hostile relations. More recent research suggests other locations may have also been the site of de Soto's crossing, including three locations in Mississippi: Commerce, Friars Point, and Walls, as well as Memphis, Tennessee. Once across the river, they continued their travels westward through modern-day Arkansas, Oklahoma, and Texas. They wintered in Autiamique, on the Arkansas River. In 1541, the expedition became the first Europeans to see what Native Americans referred to as the Valley of the Vapors, now called Hot Springs, Arkansas. Members of many tribes had gathered at the valley over many years to enjoy the healing properties of the thermal springs. The tribes had developed agreements to put aside their weapons and partake of the healing waters in peace while in the valley. De Soto and his men stayed just long enough to claim the area for Spain. After a harsh winter, the Spanish expedition decamped and moved on more erratically. Their interpreter Juan Ortiz had died, making it more difficult for them to get directions and food sources, and generally to communicate with the Natives. The expedition went as far inward as the Caddo River, where they clashed with a Native American tribe called the Tula in October 1541. The Spaniards characterized them as the most skilled and dangerous warriors they had encountered. This may have happened in the area of present-day Caddo Gap, Arkansas (a monument stands in that community). Eventually, the Spaniards returned to the Mississippi River. De Soto died of a fever on May 21, 1542, in the native village of Guachoya (historical sources disagree as to whether de Soto died near present-day McArthur, Arkansas, or in Louisiana) on the western banks of the Mississippi. Before his death, de Soto chose his former maestro de campo (or field commander) Luis de Moscoso Alvarado to assume command of the expedition. His possessions at death were four Indian slaves, three horses and 700 hogs. Since de Soto had encouraged the local natives to believe that he was an imposter deity sun god (as a ploy to gain their submission without conflict, though some of the natives had already become skeptical of de Soto's deity claims), his men had to conceal his death. The actual location of his burial is not known. According to one source, de Soto's men hid his corpse in blankets weighted with sand and sank it in the middle of the Mississippi River during the night. De Soto's expedition had explored La Florida for three years without finding the expected treasures or a hospitable site for colonization efforts. They had lost nearly half their men, most of the horses had been killed, the soldiers wore animal skins for clothing, and many were injured and in poor health. The leaders came to a consensus (although not total) to abort the expedition and try to find a way home, either down the Mississippi River, or overland across Texas to the Spanish colony of Mexico City. They decided that building boats would be too difficult and time-consuming, and that navigating the Gulf of Mexico too risky, so they headed overland to the southwest. Eventually they reached a region in present-day Texas that was dry. The native populations had thinned out to subsistence hunter-gatherers. There were no villages for the soldiers to raid for food and the army was too large to live off the land. They were forced to backtrack to the more developed agricultural regions along the Mississippi, where they began building seven bergantínes, or brigantines. They melted down all the iron, including horse tackle and slave shackles, to make nails for the boats. Winter came and went, and the spring floods delayed them another two months, but by July they set off down the Mississippi for the coast. Taking about two weeks to make the journey, the expedition encountered hostile tribes along the whole course. Natives followed the boats in canoes, shooting arrows at the soldiers for days on end as they drifted through their territory. The Spanish had no effective offensive weapons on the water, as their crossbows had long ceased working. They relied on armor and sleeping mats to block the arrows. About 11 Spaniards were killed along this stretch and many more wounded. On reaching the mouth of the Mississippi, they stayed close to the Gulf shore heading south and west. After about 50 days, they made it to the Pánuco River and the Spanish frontier town of Pánuco. There they rested for about a month. During this time many of the Spaniards, having safely returned and reflecting on their accomplishments, decided they had left La Florida too soon, leading to fights and some deaths. However, after they reached Mexico City and Viceroy Don Antonio de Mendoza offered to lead another expedition to La Florida, few of the survivors volunteered. Of the initial 700 participants, between 300 and 350 survived (311 is a commonly accepted figure). Most of the men stayed in the New World, settling in Mexico, Peru, Cuba and other Spanish colonies. From the point of view of the Spanish, de Soto's excursion to Florida was a failure. They acquired neither gold nor prosperity and founded no colonies. But the expedition had several major consequences. It contributed to the process of the Columbian Exchange. For instance, some of the swine brought by de Soto escaped and became the ancestors of razorback pigs in the southeastern United States. More devastating than the battles were the diseases carried by the members of the expedition. Because they lacked immunity to Eurasian diseases, the indigenous people suffered epidemics of illness after contracting infectious diseases, such as measles, smallpox, and chicken pox. Several areas that the expedition crossed became depopulated by disease caused by contact with the Europeans. Many natives fled the populated areas that had been struck by the illnesses for the surrounding hills and swamps. In some areas, the social structure changed because of population losses due to epidemics. The records of the expedition contributed greatly to European knowledge about the geography, biology, and ethnology of the New World. The de Soto expedition's descriptions of North American natives are the earliest-known source of information about the societies in the Southeast. They are the only European description of North American native habits before the natives encountered other Europeans. De Soto's men were both the first and nearly the last Europeans to witness the Mississippian culture. DeSoto Deluxe automobile insignia from early 1950s. ↑ "De Soto dies in the American wilderness". HISTORY.com. 1 2 Morison, Samuel (1974). The European Discovery of America: The Southern Voyages, 1492–1616. New York: Oxford University Press. ↑ MacQuarrie. Pp. 57-68, 71-2, 91-2. ↑ MacQuarrie. Pp. 96, 106, 135, 138, 145, 169. ↑ Von Hagen, Victor W., 1955, "De Soto and the Golden Road", American Heritage, August 1955, Vol.VI, No.5, American Heritage Publishing, New York, pp.102-103. 1 2 Hudson, Charles M. (1997). Knights of Spain, Warriors of the Sun. University of Georgia Press. ↑ Manatee County History, Manatee Florida Chamber of Commerce. ↑ Sylvia Flowers, "DeSoto's Expedition", U.S. National Park Service, 2007, webpage: NPS-DeSoto. ↑ Boyer,III, Willet (2015). "Potano in the Sixteenth and Seventeenth Centuries: New Excavations at the Richardson/UF Village Site, 8AL100". The Florida Anthropologist 2015 68(3-4). On-line as "Potano in the Sixteenth and Seventeenth Centuries: New Excavations at the Richardson/UF Village Site, 8AL100". academia.edu. 23 January 2016. Retrieved 23 January 2016. ↑ "The Parkin site: Hernando de soto in cross county, Arkansas" (PDF). Retrieved 2008-09-19. ↑ "Parkin Archeological State Park-Encyclopedia of Arkansas". Retrieved 2008-09-19. ↑ "A Narrative of the expedition of Hernando de Soto into Florida published at Evora in 1557". Internet Archive. Retrieved 25 November 2013. ↑ Altman, Ida (1997). "An Official's Report: The Hernandez de Biedma Account". In Patricia Kay Galloway. The Hernando de Soto Expedition: History, Historiography, and "discovery" in the Southeast. University of Nebraska Press. pp. 3–4. ISBN 978-0-8032-7122-7. Retrieved 25 November 2013. ↑ Milanich, Jerald T.; Hudson, Charles (1993). Hernando de Soto and the Indians of Florida. Gainesville, Florida: University Press of Florida. pp. 6–8. ISBN 0-8130-1170-1. ↑ Milanich, Jerald T.; Hudson, Charles (1993). Hernando de Soto and the Indians of Florida. Gainesville, Florida: University Press of Florida. pp. 8–9. ISBN 0-8130-1170-1. ↑ Charles, Hudson; Chaves, Tesser Carmen, eds. (1994). The Forgotten Centuries-Indians and Europeans in the American South 1521 to 1704. University of Georgia Press. ↑ Hann, John H. (2003). Indians of Central and South Florida: 1513–1763. Gainesville, Florida: University Press of Florida. p. 6. ISBN 0-8130-2645-8. Milanich, Jerald T. (2004). "Early Groups of Central and South Florida". In R. D. Fogelson. Handbook of North American Indians: Southeast Vol. 14. Smithsonian Institution. p. 213. ↑ Seibert, David. "De Soto in Georgia". GeorgiaInfo: an Online Georgia Almanac. Digital Library of Georgia. Retrieved 4 November 2016. ↑ Seibert, David. "De Soto in Georgia". GeorgiaInfo: an Online Georgia Almanac. Digital Library of Georgia. Retrieved 7 November 2016. ↑ Fernbank Museum of Natural History (2009-11-05). "Archaeologists Track Infamous Conquistador Through Southeast". Science Daily. ScienceDaily LLC. Retrieved 2010-11-14. ↑ Pousner, Howard (2009-11-06). "Fernbank archaeologist confident he has found de Soto site". The Atlanta Journal-Constitution. Retrieved 2010-11-14. 1 2 "The Old Mobile Project Newsletter" (PDF). "University of South Alabama Center for Archaeological Studies". Retrieved 2007-11-19. 1 2 Higginbotham, Jay (2001). Mobile, The New History of Alabama's First City. Tuscaloosa, Alabama: The University of Alabama Press. p. 10. ISBN 0-8173-1065-7. ↑ Clayton, Lawrence A.; Knight, Vernon J.; Moore, Edward C. (1993). The De Soto Chronicles: The Expedition of Hernando De Soto to North America in 1539–1543. Tuscaloosa, Alabama: The University of Alabama Press. ↑ Tony Horwitz (April 27, 2009). A Voyage Long and Strange: On the Trail of Vikings, Conquistadors, Lost Colonists, and Other Adventurers in Early America. Macmillan. p. 239. ISBN 978-0-312-42832-7. Retrieved March 3, 2012. ↑ Flowers, Judith Coleman (2016). Clarksdale and Coahoma County. Arcadia. ↑ Marley, David (1998). Wars of the Americas: A Chronology of Armed Conflict in the New World, 1492 to the Present. ABC-CLIO. p. 45. ↑ McNutt, Charles H. (1996). McNutt, Charles H., ed. The Central Mississippi Valley: A Summary. Prehistory of the Central Mississippi Valley. University of Alabama Press. p. 251. ↑ Charles Hudson (1997). Page 320-325. 1 2 Charles Hudson (1997). Page 349-52 "Death of de Soto". ↑ Louisiana Department of Culture, Recreation and Tourism. "Hernando de Soto Historical Marker". Retrieved August 9, 2009. 1 2 Robert S. Weddle. "Moscoso Alvarado, Luis de". Handbook of Texas Online. Retrieved 2007-11-22. ↑ "Martin/de Soto Site History". Retrieved 2010-09-15. ↑ Galloway, Patricia (2006). The Hernando de Soto Expedition: History, Historiography, and "Discovery" in the Southeast. University of Nebraska Press. pp. 172–175. ISBN 978-0-8032-7122-7. ↑ Joseph C. Porter. "Explorers Are You:Tar Heel Junior Historians, Pigs, and Sir Walter Raleigh" (PDF). North Carolina Museum of History. Retrieved 2010-09-15. ↑ Tina Easley. "Razorbacks [Hog]". Encyclopedia of Arkansas History & Culture. Retrieved 2010-09-15. ↑ John Pukite (1999). A field guide to pigs. Falcon. p. 73. ISBN 978-1-56044-877-8. ↑ Josephy, Alvin M., Jr. (1994). 500 Nations, An Illustrated History of North American Indians. New York, New York: Alfred A. Knopf. pp. 142–149. ISBN 0-679-42930-1. ↑ Josephy, Alvin M., Jr. (1994). 500 Nations, An Illustrated History of North American Indians. New York, New York: Alfred A. Knopf. pp. 152–153. ISBN 0-679-42930-1. "De Soto, Fernando". The American Cyclopædia. 1879. "De Soto, Fernando". Appletons' Cyclopædia of American Biography. 1900. "Soto, Ferdinando de". Encyclopædia Britannica (11th ed.). 1911.